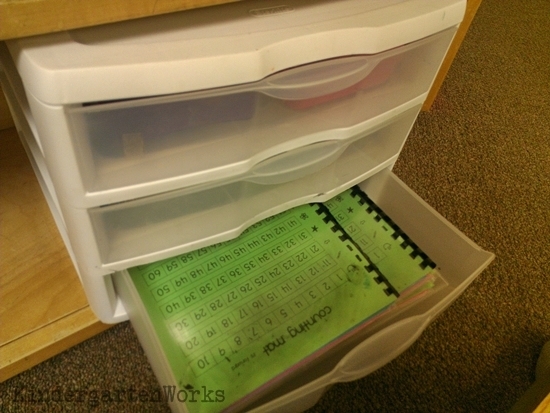 Be sure to read why that guided math binder has a place all its own. Having the teacher zone table up in front of a set of shelves gives me space to store group materials. I keep a white basket with the materials needed for our wrap ups, warm ups or general lesson materials. Often I have a set of cards, a game or special manipulatives. This basket travels to the closet cupboards whenever I’m ready to change out materials for the following week. 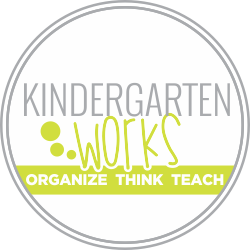 There are some materials and manipulatives that will come in handy all year and that I need to have at my fingertips to teach in the moment, change something up or help a kinder work through a misconception. These materials live in a 3 drawer unit and are always on hand. The top drawer has shape attribute blocks, ten frames drawn onto craft foam (with no dots drawn) and bingo chips. I keep these items stored in pencil boxes so that clean up is simple. 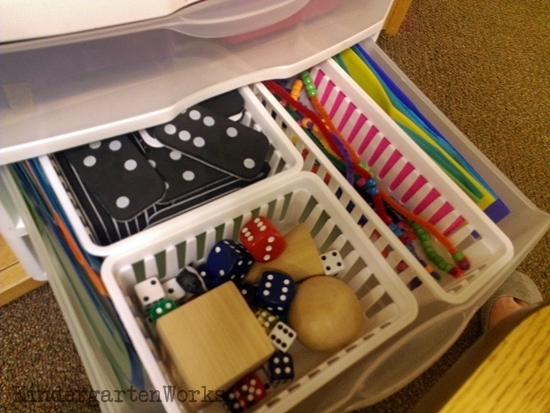 The middle drawer holds number lines, dice, 3D shapes, foam dominoes and bead bracelets. 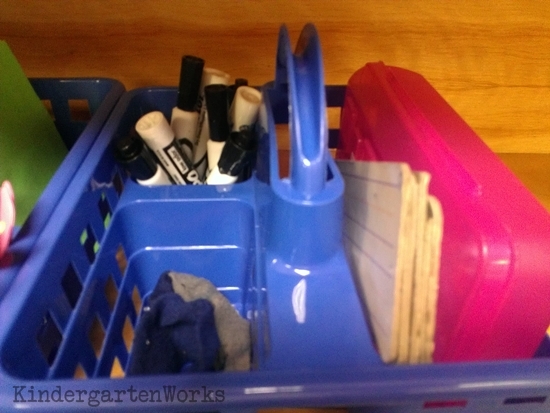 I definitely use the dice most often and the baskets help keep multiple items all organized in one drawer. The bottom drawer also see daily use. I placed these into the bottom since they are the heaviest. They are sets of laminated math mats. We have items in here like counting 1-100, ten frames, teen frames, shape fluency, and number identification fluency. I love Melissa’s counting mats. These stay close for daily grabbing in the three-drawer unit. They are laminated and bound are sturdy enough for daily practice! We use her counting forwards and backwards pages. 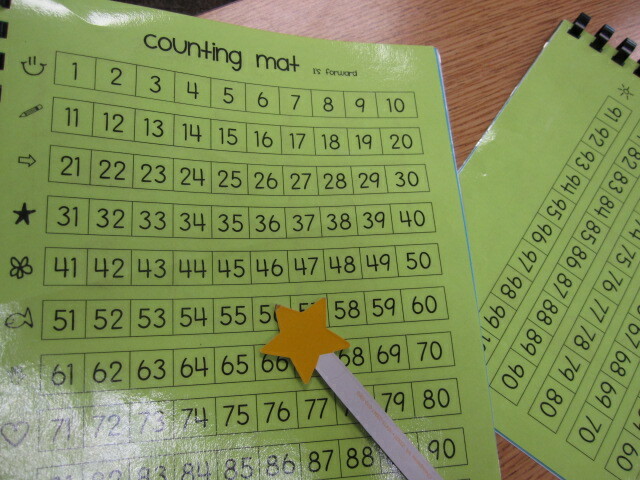 We use these for a large part of the year as we are learning to count to 30, 60 and then to 100. You can use them in a variety of ways and the picture clues are perfect when working with kinders. At the end of last year we were using these with my highest math group (like a number line) to do large number addition and subtraction problems using groupings of tens and ones. 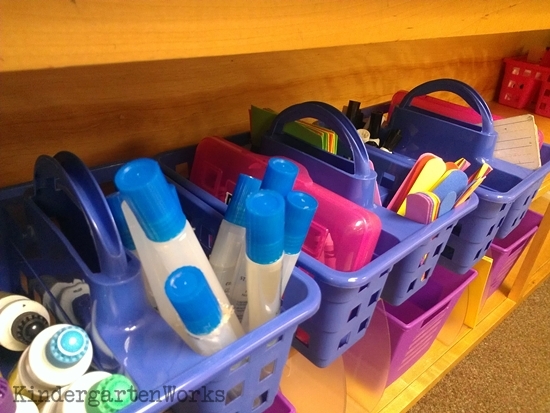 The four purple baskets pictured on the bottom shelf hold materials specific for each group and individual kinder sets of materials. The baskets have the group label and students’ names on them. I keep pencil boxes for additional materials used regularly by the groups. I think of these more as our daily tools. 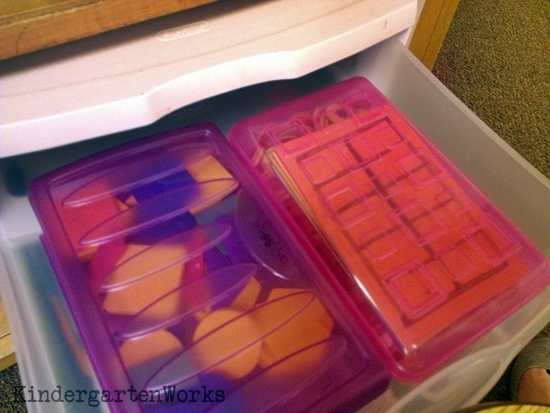 I store dot makers, glue, pencils, crayons, markers, pointers, craft foam (used for flash cards) and dry erase tools. 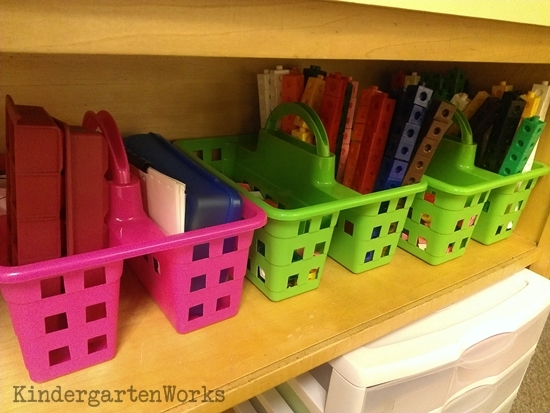 Last year I found out that I really needed to keep linking cubes on hand for bump games and for a few subitizing activities, so I added two baskets for those. Not necessary to keep out, but I have the shelf space, so I can do it. So with a table, group materials basket, four group baskets, and a year long set of materials housed in a three-drawer unit… you add in tools that I want to keep for use at just this table (seen in the pencil caddies)… we’re all set to go. 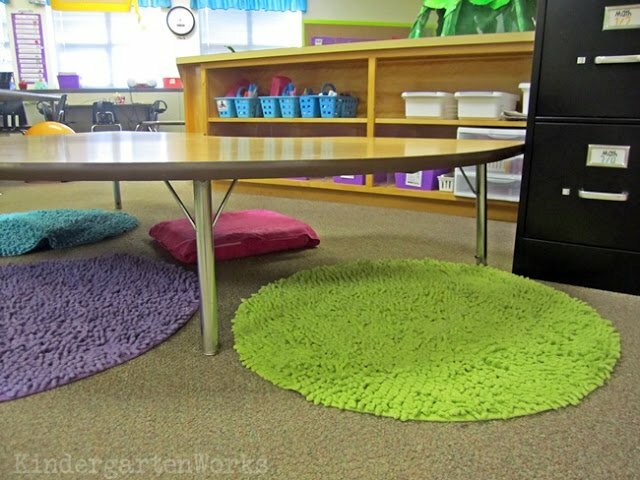 Those are my guided setup tips to get you on the road to having your own small group space for guided math. I absolutely love your ideas for guided math and thank you so much for the useful links you provided for some materials. I have been starting at your guided math table for the last few minutes thinking how genius it is to have it on the ground. I bet that is so special and fun for the kids too. I think mine would love it and I am going to brainstorm on Monday how to make it work in my room. Thanks for the great ideas! You maximized your space. All things has it’s own place. Very organized. Thanks for sharing it. Ok, I couldn’t stop thinking about the green/yellow/red mats you use for flashcards and turns out I only have green foam in stock=( So I made a document with the colored areas to print and include in my kids math mat folders (I like how you bound yours though). Anyway, do you care if I share on my blog? I’d link back to your wonderful idea of course. 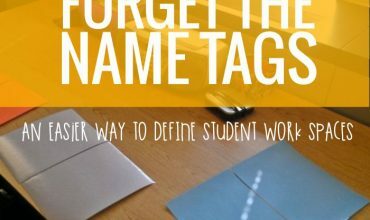 Great plan to include them into your folders so that they are ready! Great idea! 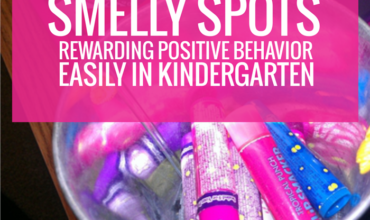 I’d be flattered if you shared Melissa – thanks! I needed to read this post. I’m heading to school tomorrow to do some organizing and I think I know where I’ll start now. I love the green/yellow/red mats for flashcards, and I already have foam=) And thanks for mentioning my counting mats! Thanks Melissa – I love them! Thanks Renee! I appreciate your comments – Thank you for sharing your time!